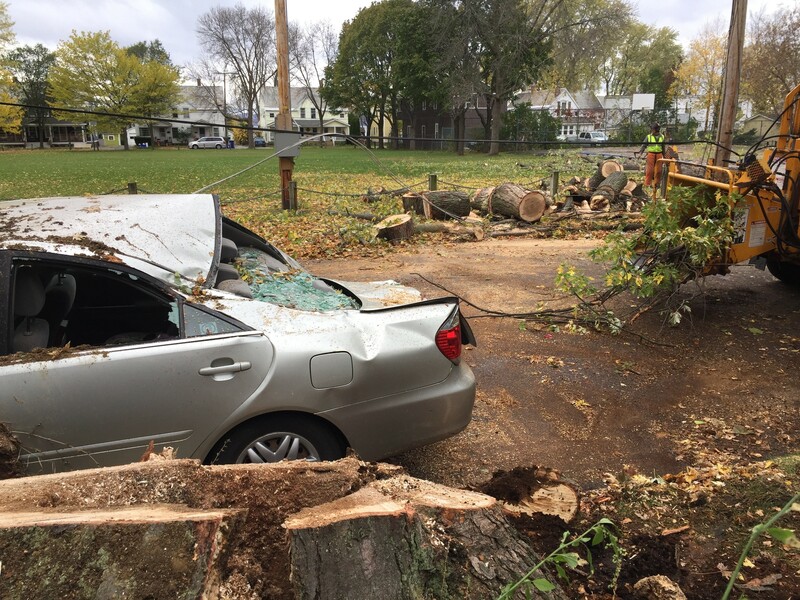 A large tree crushed a car and took down power lines in Burlington's Lakeside neighborhood. The preliminary bill from last week's wind and rainstorm that left a third of Vermonters without power stands at $4.5 million, state officials announced Tuesday. Wednesday, Vermont officials and representatives from the Federal Emergency Management Agency will begin traveling Vermont to verify the damage. Their preliminary assessment will determine if the state qualifies for a federal disaster declaration, which would bring money to fund recovery efforts. For Vermont to qualify for aid, FEMA must verify more than $1 million of damage, which includes restoration costs for public utilities. State officials say Vermont should surpass that figure with ease. They have already identified more than $4.5 million in public infrastructure damage, Vermont Emergency Management spokesman Mark Bosma said. The storm, which had sustained winds more than 60 mph in some places, was unusually widespread, leaving virtually no corner of the state untouched. Evaluators are scheduled to conduct assessments in 10 counties: Addison, Chittenden, Essex, Franklin, Grand Isle, Lamoille, Orange, Orleans, Washington and Windham.